Corporate greed causes climate change, Leonardo DiCaprio, “The Revenant” star, scolded attendees at the World Economic Forum. He’s not entirely correct. For one, he pins the problem on oil and gas producers rather than the business world at large. But in one sense the actor is on to something: compensation could play a role in a larger climate solution. Most companies at the annual confab in Davos, where DiCaprio made his table-thumping speech after receiving an award, got the message about going green long ago. The Paris Pledge for Action in December looped in over 400 companies all determined to measure and reduce their emissions. Some, like Unilever and General Electric, have long included sustainability among their fundamental business goals, and many companies factor these into pay calculations. What happens if they fail? That’s where the whole thing falls a bit flat. There’s the embarrassment factor for company bosses, of course. Groups like the We Mean Business Coalition can watch and monitor, and potentially name and shame, to see if performance metrics are met. But chieftains still have much more to lose from delivering disappointing returns to shareholders than from missing renewable energy or carbon targets. Where sustainability feeds into bonuses, it is typically one of dozens of factors. One answer may be found in the post-crisis financial industry: the bonus clawback. If a banker or trader is found to have fouled up years after the fact, remuneration for that year can be partly reversed. That hasn’t yet filtered through to environmental issues in any noticeable way. Perhaps the best thing would be for company bosses to take action proactively. After all, in November, 79 CEOs used the World Economic Forum platform to call on governments to take climate change seriously. Those now in Davos could follow that up with a pledge to go carbon neutral by 2020, or forego a year’s bonus, or designate it to charity or one of the many funds raising money for investment in green technology. Davos attendees regularly pontificate that social purpose and profit can mix. Shareholders may not agree enough to crack the whip. But climate change demands big gestures. Stealing the show back from Leonardo DiCaprio, whose latest performance garnered him an Oscar nomination, won’t be easy. But company bosses have important supporting roles to play. 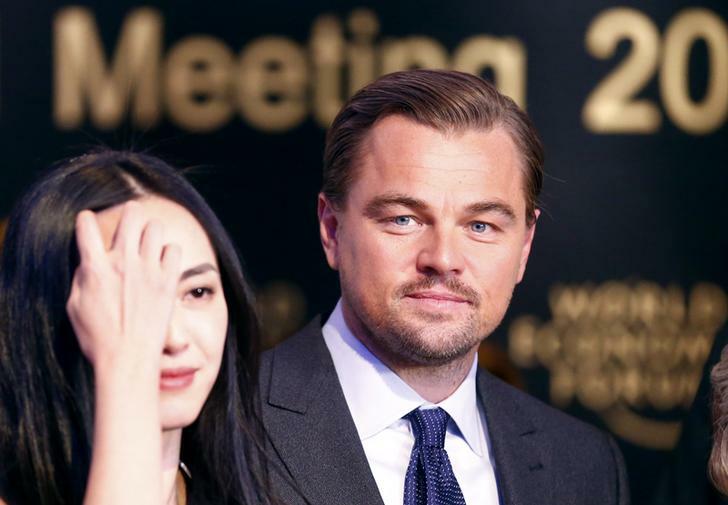 Chinese actress Yao Chen (L) poses with actor Leonardo DiCaprio after receiving their Crystal Awards during the annual meeting of the World Economic Forum (WEF) in Davos, Switzerland January 19, 2016. Actor Leonardo DiCaprio used a speech at an awards ceremony at the World Economic Forum in Davos, Switzerland, to criticise the “corporate greed” of oil and gas companies and their role in climate change. DiCaprio was honoured on Jan. 19 with a Crystal Award by the World Economic Forum for his contribution to fighting a climate crisis. He said his foundation would make a new $15 million donation to environmental projects.